Official artwork of Mother Brain from Metroid: Zero Mission. 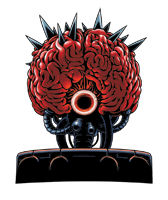 Mother Brain (マザーブレイン, Mother Brain) is a major antagonist from the Metroid series. She appears in Super Smash Bros. 4 and Super Smash Bros. Ultimate as an Assist Trophy. 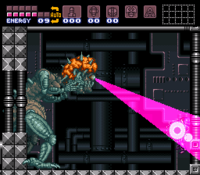 Mother Brain as she appeared in Super Metroid in her mechanized bipedal form using Laser Brain Attack on Samus. Mother Brain is a recurring antagonist of the Metroid series, and a major leader of the Space Pirates. She appears in Metroid (and its remake Zero Mission), Super Metroid, and in a flashback sequence in Metroid: Other M.
In Metroid, Samus had to fire missiles in the opening of Mother Brain's Control Capsule while avoiding enemy Rinkas. In Super Metroid, the first half of the battle is similar to the battle in Metroid, except Samus now has to break the Control Capsule before damaging Mother Brain. After Mother Brain is seemingly defeated in Super Metroid, she transforms into her bipedal form with a mechanized body, and she also opens her eye. Towards the end of the battle, she will fire Laser Brain Attacks from her eye that almost kill Samus before being saved by a Metroid. In the Metroid remake, Metroid: Zero Mission, the battle is identical to how it was in Metroid, except Samus had to break the Control Capsule before damaging Mother Brain, and after it is broken, she opens her eye and fires blasts from it. Mother Brain as she appeared in Metroid: Zero Mission. Overall, Mother Brain's appearance in SSB4 and Ultimate is based off her appearance in Metroid: Zero Mission, as her Control Capsule is damaged and she has her eye opened; however, the Laser Brain Attack she uses originates from Super Metroid, but was only used in her mechanized bipedal form. Mother Brain appears as a sticker in Brawl. Mother Brain appears in Super Smash Bros. 4 as an Assist Trophy. She uses her signature Laser Brain Attack when summoned, and is guarded by Rinka enemies. She can be killed by hitting her from behind after the Control Capsule's glass shatters following the laser blast. Mother Brain stands as potentially one of the most damaging Assist Trophies in the game, as her Laser Brain Attack can do up to 90% damage if all hits connect, and will guarantee a shield break if an enemy decides to shield it. Despite such, it only does moderate knockback. Hailing from the Metroid series, this evil boss resides on the planet Zebes. When she appears in Smash Bros., she attacks with energy projectiles and a beam from her eye. It's actually possible to defeat her, and for once doing so won't start a self-destruct sequence. A mainstay of the Metroid series and the final boss Samus faces on Planet Zebes. In this game, she grows to a gargantuan size and fires all sorts of energy blasts at you. Good news: you can beat her! Better news: doing so won't trigger a self-destruct sequence forcing you to make your escape! Mother Brain returns as an Assist Trophy in Super Smash Bros. Ultimate, seemingly without any change in function. Training Mode describes her Assist Trophy: Shoots a powerful beam from her eye. Rinkas help her out. Mother Brain also appears as a spirit, using her artwork from Zero Mission. This Primary Spirit is Ace class and Shield type, with 1 support slot. After reaching level 99, she can be enhanced to Mother Brain (2nd Form), based upon her final form from Super Metroid; this enhancement raises her class to Legend and makes a fighter giant while she is equipped. This page was last edited on April 12, 2019, at 21:14.